One of the keys to delivering a high standard of education to all students is a well-rounded curriculum. At Melksham Oak Community School, we follow a comprehensive curriculum that incorporates an array of subjects. Within each subject, a variety of topics are covered, ensuring that each child gains an in-depth understanding of the subject. To support the students’ development of literacy, we use POW Panda. POW is an acronym that stands for punctuation, organisation, and words. POW will be used in all lessons to help students develop and apply their literacy skills across the board. In addition, we have reading books for year 7 and 8 that are read in English and linked to via homework from all other subjects. To support students with their numerical skills, we use Number Ninja. This helps students establish and understand the links between maths in lessons and numeracy skills across all subjects. At Melksham Oak we have created the SELF Framework that encompasses all aspects of one of the foundations of the TEEP Model, Effective Learner Behaviour. 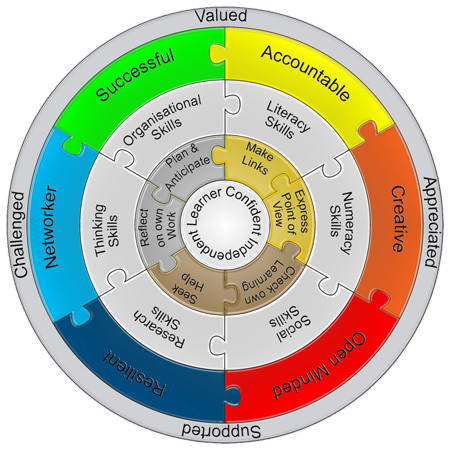 The SELF Framework encapsulates the personal qualities, skills and behaviours, that we believe Confident Independent Learners possess. SELF is explicitly shared with students so that they are very clear about the personal characteristics, skills and behaviours that they need to master to be highly effective learners. These SELF elements are referred to during lessons and extra-curricular sessions to emphasise the core personal, learning and thinking skills required to not only excel at school but in adult life.